See the news release on early admissions for details. There is enough good information here that we need to spend four days reviewing it. This is day 1. 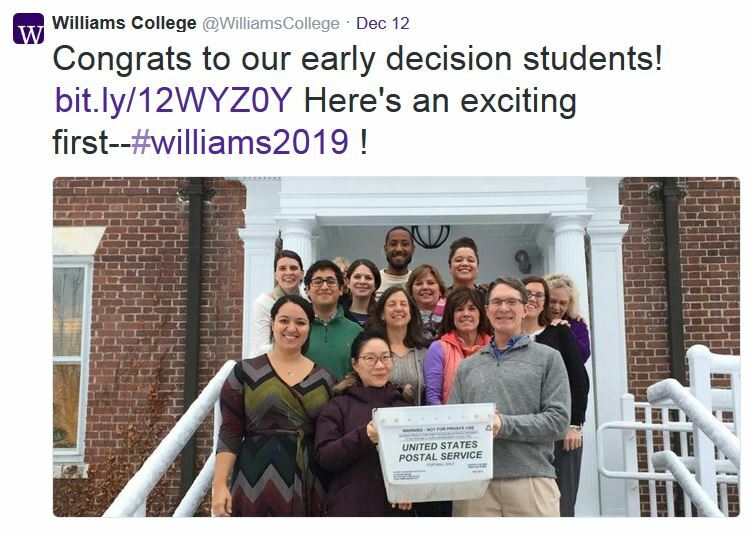 Williams College has offered admission to 244 students under its Early Decision plan. The 112 women and 132 men will comprise 44 percent of the incoming Class of 2019, whose ultimate target size is 550. A better run blog would maintain a time series of this information. How has ED data changes over time? Alas, we have fallen behind on this and many other fronts. My New Year’s Resolution is to spend much more time on EphBlog in 2015. What would readers like to read about? Do we have any readers from the class of 2019? Let us know in the comments. In fact, tell us about yourselves! One project in 2015 will be to collect as many Twitter accounts, Tumblrs, blogs and other (public) profiles of Williams students. Recall EphBlog’s purpose: To encourage, organize and support the Williams Conversation. If you are an Eph with something to say, we want to share your words and pictures with the broader Williams community. More to come in January . . .
What percentage of those who applied ED and failed will end up matriculating at Williams? Something that jumps out is the gender split. In recent years, women have outnumbered men by a decent margin in the ED admits. This year it’s reversed. Frank: just a handful. Very, very few deferred applicants are admitted RD (I think it’s roughly around a dozen, give or take, most years, although that number could be a bit higher or lower). Frank, PastEph: When the class of 2012 was being admitted (so, winter 2007 and spring 2008), the number cited was about 15-20 deferrals who were admitted as RDs. Randomly, I knew two applicants who were deferred, then admitted, that year. Both ended up attending Williams, which is not surprising since they chose to do ED. Of the 593 that applied ED to the Class of 2019, how many were deferred? I read that at Harvard over 70% of ED applicants were deferred and over 50% were deferred at Yale. Based on the news release and assuming those rejected as ED applicants constitute all of those “deferred”, then the answer is 593 minus 244, about 7/12 of those applying. Thanks, Frank. I would have expected some outright denials in the ED round. I thought the NESCACs were more decisive than the Ivies in the ED round and only deferred those that had an actual chance (though the absolute number of ED deferrals that are admitted RD is small based PastEph’s comment above). Some of those deferred were in fact outright denials. I think that more are generally deferred than denied. Williams does not, I believe, provide those statistics. EphBlog is powered by WordPress and delivered to you in 0.863 seconds using 38 queries..